When I had our first baby and settled in as a full-time homemaker, my husband came home from work each day with interesting stories and details of growing relationships in his ministry, but I quickly started dreading when he’d turn to me and ask, “What did you do today?” I managed a shower, and I changed countless diapers and nursed, that’s what, and somehow that felt both productive and completely inane at the same time. Sometimes, on our walks around the neighborhood after dinner, he’d ask another question: “What are you reading in the Word these days?” I’m grabbing small bites before my eyelids close on me, and I can’t keep anything in for more than five seconds, that’s what, because my post-partum brain feels like a sieve. But I wanted more. I wanted to know that my life wasn’t over and that God was at work in me and in our home. I distinctly remember thinking that all I had learned in my years of spiritual growth and sanctification leading up to that moment were being tested. The sleeplessness, self-sacrifice, and mundane were drawing out what God had already taught me in His grace. Gospel application happened countless times everyday. And, most significantly, I recognized that my home and my baby would be both my proving ground and my further education in the gospel. 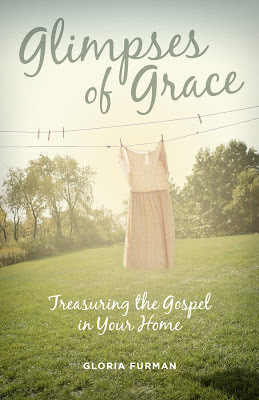 This idea—that the home demonstrates and crystallizes the gospel—is the message of Gloria Furman’s new book, Glimpses of Grace: Treasuring the Gospel in Your Home, and why I resonated with it so much. The book acts as a rich theology book, encouraging women to think critically about why and how the gospel applies to the mundane of life. I hadn’t thought of it quite like that, and it convicted me. God isn't just available to me in the quiet morning. He is available to me in every chaotic moment of my day, but do I turn my attention to Him? Do I see interruptions as opportunities or annoyances? The truth is, as Gloria points out, that God and His gospel are at work in and around me every day, if I just have eyes to see it. God is available to you, too, and, when you give yourself to Him and to the transforming power of His gospel, you will find the joy and perseverance you need to thrive in the mundane. You can find Gloria online at Domestic Kingdom or on Twitter.